Calling Abroad Has Never Been So Easy! Vonage makes calling abroad inexpensive and simple. Unlimited¹ landline calling to 60 countries. Unlimited¹ mobile calling to more than 10 countries. Unlimited¹ local and long distance calling to the U.S., Canada and Puerto Rico. Vonage Extensions® — extend this calling plan to any phone, even mobiles — at no extra charge. No additional costs to keep your existing number. Depending on which country you choose to call, you could get unlimited¹ calling to mobiles and landlines when calling abroad with Vonage World! Instead of having one calling plan for landlines and a separate one for mobiles, Vonage World covers it all. And with this calling plan you’ll never have to watch the clock or set any timers, because you can (potentially) have unlimited¹ minutes when calling abroad. Get Vonage World today to talk to your loved ones without hesitation! These days, the small business owner wears many hats – from sales and marketing, to IT and Finance, and more. The need to streamline processes, cut costs and increase efficiencies in an increasingly mobile environment, is critical. Unified Communications as a Service (UCaaS) solutions such as those provided by Vonage, give small businesses the ability to become more efficient, productive and mobile, all while cutting costs and eliminating the need for on-site IT staff to manage on premise systems. Today’s small business owners are engaging with a rapidly evolving workplace – 45% of which are millennials. In fact, that number is expected to skyrocket to 75% by 2021. This increasingly mobile and distributed workforce expects their “office” to be wherever they are located – whether that is at home, in the car, visiting a customer or even at a local coffee shop. Therefore, it’s no surprise that according to the SMB Group, a growing majority of small businesses now regard mobility as an essential business enabler, with 60% saying mobile solutions are critical to their business. Mobility is a key benefit to communications in the cloud. Mobile apps can fully integrate with the business phone system, enabling employees to make and receive business calls and text messages when they’re on the go, maintaining a consistent business presence, and accessing the same robust voice, video and messaging features they enjoy in the office. Additionally, with the adoption of bring your own device (BYOD) on the rise to rise, 59% of small businesses with 10 to 999 employees now support BYOD, a dedicated mobile app enables employees to keep their business and personal accounts separate on the same device. Additionally, with 27% of small businesses indicating they have no IT support, UCaaS makes things easy by giving small businesses access to new features as they become available, providing them with the ability to scale up or down as needed, adding phone lines with the click of a mouse. Finally, a UCaaS solution can easily integrate CRM solutions, billing software, and more with a VoIP system to extend the power and control of the phone system to a desktop. This helps small businesses become more efficient by leveraging the business-class tools they already use, wherever employees are and whenever they need to use them. Satisfying the unique needs of small businesses, UCaaS solutions provide cost-effective, scalable, feature-rich communications that can help small businesses successfully compete with companies many times their size. This frees up business owners to focus on their bottom line, not their communications system. “Do the Right Thing” is one of Vonage’s core values, and it is put into action daily both in how employees interact with each other and with customers, and through the dedication each employee shows to being a good corporate citizen by giving back to our communities. In October 2012, Superstorm Sandy ravaged the Jersey Shore, home to many Vonage employees. While most were impacted for days without power, some employees faced much worse, including significant damage to their homes. The Company came together during this time, opening up the Vonage headquarters to employees and their families, offering them a warm place to stay, shower, charge their phones and providing them with meals. Additionally, employees donated money, food, clothing and basic supplies to their displaced coworkers. And, in the wake of Superstorm Sandy, in less than eight weeks, more than 500 Vonage volunteers worked in affected communities to help with relief efforts. Continuing that momentum, Vonage has since launched its Vonage Volunteer Program to provide every employee with the opportunity to volunteer their time, up to three days per year, with pay. In addition to the ongoing volunteer efforts for Superstorm Sandy relief, employees volunteer with organizations such as the Salvation Army, the American Red Cross, local food banks, and more. 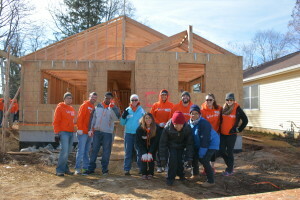 Volunteer efforts are not limited to Vonage’s Holmdel headquarters and have expanded along with the Company’s growth. Each Vonage location across the country organizes community volunteer events of their own to help the communities they serve. For example, Vonage’s Atlanta office recently partnered with Techbridge, an Atlanta-based nonprofit that drives community impact by bringing affordable technology and business expertise to other nonprofits. The Atlanta team hosted a week-long employee fundraiser in the office to raise money to provide the Atlanta Children’s Shelter with better access to technology. Since its inception, the Vonage Volunteer Program has become a part of life for employees. In fact, in 2015, employees contributed nearly 1,000 hours of community service in the Holmdel office alone. 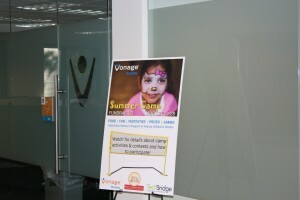 Vonage’s employee volunteer efforts continue to grow, with more and more events planned across the company’s locations. 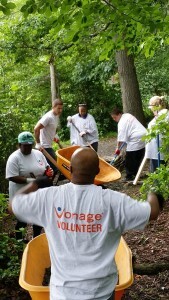 In addition to the employee volunteer program, Vonage donates the use of its facilities to outside organizations for charitable use. The Company has had a long-standing relationship with Heroes and Cool Kids, a New Jersey non-profit organization that utilizes the services of current and former professional athletes whose personal life experiences enable them to train high school student leaders. The organization uses Vonage’s corporate headquarters several times a year for training. In addition, Vonage also hosts charity runs and opens up its campus for social events for teen patients at the Children’s Specialized Hospital of New Jersey. Vonage also provides in-kind donations of phone service to non-profits and has provided free phone service to both Vonage customers and non-customers after natural disasters such as the recent earthquakes in Japan and Ecuador and to Mexico in advance of Hurricane Patricia. At Vonage, we strive not only to improve the lives of our customers every day, but to embody exemplary corporate citizenship by giving back to the communities in which we live and work. At the keynote, Suppliers Going Big!, Peterson sat beside a panel of industry peers to address how each is making strategic decisions to help their partners and agents increase sales and continue to delight customers. For Vonage, it’s clear that with a rich history of innovation, evident in products such as gUnify and SmartWAN, the Company continues to challenge the status quo and provide partners with a better way to be successful. Peterson called Vonage a one-stop shop for partners, providing exceptional products, technology infrastructure, service delivery, training, marketing and provisioning, and ongoing support for their business and their customers. With the keynote presentations complete, the second day of the conference opened up the Expo show floor. 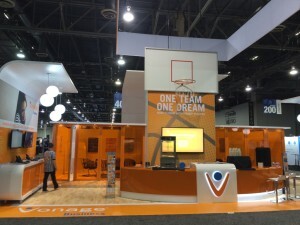 The Vonage booth, as always, was decked out in its iconic orange hues, this time with a new sports theme – One Team, One Dream – which drove home the message that Vonage works closely with partners to provide the ultimate, single destination to serve the needs of every customer. A basketball hoop was front and center as you entered the Vonage booth, challenging those who stopped by to shoot some hoops and celebrate St. Paddy’s Day with corned beef and cabbage sliders. Vonage products were on full display with several technology stations throughout the booth where Sales Engineers offered demos of Vonage’s two purpose built cloud-based platforms, Essentials and Premier, as well as network optimizing SD-WAN technology, Vonage® SmartWAN, and other complementary cloud services such as Virtual Desktop and Infrastructure as a Service. gUnify integrations with business workflow tools, such as Salesforce® and Clio®, were a hot ticket item at the demo stations, as the growing need for flexibility and mobility rises to the top of customer demands. Building on this message of the power of mobility, Vonage also participated in a panel discussion – Empowering the Mobile Workforce – to discuss how mobility can be used as a competitive advantage for providers and partners alike. Sanjay Srinivasan, VP and Chief Technology Architect, Business Engineering, provided insight into Vonage’s goal to deliver enhanced mobility and productivity for employees where location and device become irrelevant. The very nature of cloud-based unified communications enables employees to work from any location with access to the same information and functionality that they have in the office. 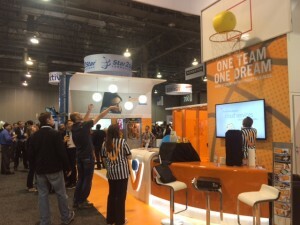 On the final day of the conference, the Vonage booth had seen hundreds of visitors and the net saw more than 1,000 points scored. But the real buzzer beater of the three-day event was Vonage’s win of the coveted Best Booth Award, beating out more than 200 exhibitors. Having just been named by Channel Partners the night before as a recipient of the 2016 Circle of Excellence Award, Clark Peterson served as the day’s MVP and accepted the award on behalf of the Company. An annual recognition, Peterson was named to the Circle of Excellence, an elite group of channel chiefs and executives, for his leadership, vision and innovation in serving the channel. Vonage also honored its partners at the event, announcing 13 channel partners as the newest members of its prestigious President’s Club. The top partner awards annually recognize and reward Vonage Business channel partners based on sales performance for the year. The key takeaway from this year’s conference is that Vonage is committed to the channel. The Company’s investment in sales, marketing and technology infrastructure to support channel partners will help to ensure that partners will continue to be successful. Vonage helps partners to create happy end customers. And, that creates a more profitable relationship for everyone. Through countless scheduled and impromptu meetings at the booth, and through a lively exchange of ideas at two high profile panel discussions, Vonage made a meaningful impact on attending channel partners at this year’s event, letting them know that Vonage Means Business. And, fortunately for the Company, what happens in Vegas won’t stay there this time. Productivity anytime, anywhere. Advanced UCaaS solutions give employees access via a smartphone, desk phone or softphone to all their calling features and important business software, whether they are in the office, at home or on the road. Constant, consistent access means employees have greater control over their productivity. Integration with cloud-based apps. UCaaS solutions can integrate a business phone system with myriad applications, ranging from Salesforce® and Zoho® to Clio®, Sugar and Microsoft Dynamics®. This makes the system dynamic and adaptable, as new tools are introduced and upgraded, without the need to overhaul an entire system. Grow when and where you want. A unified system for communications enables your company to scale up and down easily as your company evolves. You aren’t tethered to complex hardware and devices, so you can make adjustments as you grow. No need for costly, cluttered cables. With hardwired phone lines, changes in cable access and hardware are required to accommodate new staff structure as companies scale up or down. With cloud-based services, it’s easy to add or remove employees. And, the company can utilize personal or company-owned devices, thus saving time and money. Over the past five years, we’ve seen the UCaaS industry grow and evolve exponentially, and we foresee many more improvements in the coming years. As a company, we’re investing in customer care, broadening our sales forces and the continued development of our product pipeline. For now, we’re keeping our heads in the clouds. We hope you will too. The color orange is typically associated with joy, sunshine and the tropics. The Vonage booth at this year’s Enterprise Connect, had plenty of these and a whole lot more. Joyful people coming together to collaborate and innovate under the warm Orlando sun in Florida’s Orange County, and plenty of frothy, fruity mango orange beverages to fuel the creative sparks zinging around the 1,600 square foot custom booth – outfitted from top to bottom in iconic Vonage orange. Orange is vibrant. It’s engaging, exciting and edgy. 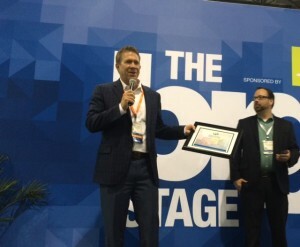 Vonage attended this year’s conference and expo with orange gusto, participating in thought leadership panels and presentations, and enjoying finalist status for the annual Best of Enterprise Connect award for the Company’s launch of its SD-WAN technology product Vonage® SmartWAN. The four day conference and expo, the premier event for the enterprise communications industry, kicked off for Vonage with a place on a panel discussion dedicated to Unified Communications-as-a-Service (UCaaS) offerings. 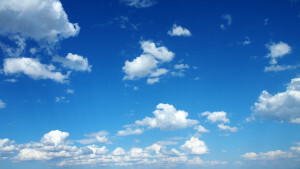 A UCaaS/Hybrid RFP: What Can Cloud Providers Deliver? was moderated by technology consultant Dave Stein, who created a mock RFP for communications service based on the panelists’ submissions. Jeff Savage, VP of Enterprise for Vonage, walked the panel and the room through the Vonage offering, from hosted voice to complementary cloud services, including differentiating features, functionality and pricing. All five providers were ranked accordingly, and Vonage came out unsurprisingly on top – a testament to its standing as a clear leader in the UCaaS space. With so many providers and vendors demonstrating the latest innovations in the industry on the expo show floor, attendees were left to wonder how this market – disruptive in and of itself – will continue to evolve and shape the way their companies do business. The Market Leaders Theater Stage at Enterprise Connect was set up for that very reason – to give exhibitors the opportunity to present what they are doing and how they plan to lead the way for emerging technologies in the UCaaS space. Jeff Savage continued his orange tour of Vonage offerings on Tuesday, March 8, presenting his thoughts on the subject during Tuesday’s Expo hours to lend perspective on how Vonage has quickly positioned itself as a leader in the UCaaS market, and how its offering will continue to evolve to meet the changing needs of businesses. The sun continued to shine brightly over O-Town on Wednesday, March 9, as every seat filled to observe a discussion on the Cost of the Cloud, which included Vonage’s own Clark Peterson, President of Enterprise. Peterson and fellow panelists captured the attention of the audience, made up of analysts, media and decision makers for large companies, that was eager to understand how the cost of moving communications to the cloud changes the business model, especially for those in the Enterprise space. Key points Peterson was quick to point out is that providers will continue to do whatever possible to keep costs down while continuing to offer more and more services to drive value. “Enterprise customers are looking for a full UC feature set that’s easy to deploy and use – that’s our task as service providers,” he pointed out and added, “it’s critical to provide all services to all customers.” This is when the real value of cloud communications shines through. On Wednesday afternoon, the conversation turned to fellow communications innovator Google and what the company brings to the unified communications (UC) table. Vonage’s Crisantos Hajibrahim, Senior Director of Business Development participated in this panel discussion to support the overarching theme that integration is what makes Google Apps for Work a UC product. Integration with Google Apps, as well as other critical business applications, such as CRM, with voice as a platform – that is Vonage’s targeted approach to unified communications. “Vonage looks at the bigger picture” when it comes to integration, Crisantos observed. 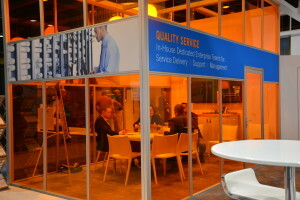 “Every customer is unique and runs their business differently – we need to provide a solution that they want and need.” Vonage addresses these needs by building an integration solution to make all of the applications and tools that its customers are using – including Google apps – talk and work together seamlessly for truly elevated business communications. Sanjay Srinivasan, VP and Chief Technology Architect Business Engineering rounded out the week of thought leadership with an extended focus on contextual communications and how its integration can benefit businesses, particularly large enterprises with multiple offices spread across locations. The emphasis of the discussion between the five panelists centered on three emerging technologies to watch as contextual functionality continues to take hold in the business communications space – WebRTC, communications APIs and advanced analytics. Attendees were encouraged to envision and then plan for what their respective companies will need to do to implement contextual communications into their operations in the future. Throughout the conference, the expo show floor was flooded with attendees focused on learning and experiencing the latest and greatest that communications providers had to offer. The Vonage booth, awash in a soft orange glow, hosted more than 1,300 visitors, who partook in interactive demos of Vonage products and services, tried their hand at mini putt golf for a chance to win a Scotty Cameron putter, and met with Vonage executives to discuss the bright future of UCaaS. Vonage is known not only for its affinity to orange but for its early disruption of the residential communications market and now for its historic transformation as an innovator in the business communications space. Vonage’s offering is unique* – the Company continues to challenge the status quo, by finding a better way to help people to connect and do business.